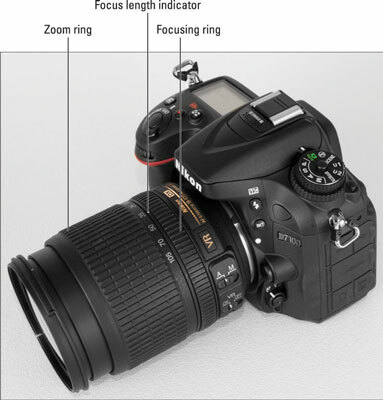 Lens focus-mode switch: Assuming that your lens offers autofocusing as well as manual focusing, it has a switch that you use to choose between the two options. On the 18–105mm kit lens shown, the switch has an M setting for Manual focus and an A setting for Autofocus. Other lenses may offer different switches, so check your lens instruction guide for specifics. 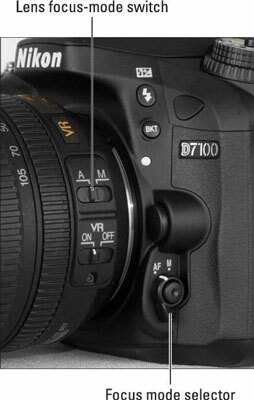 Focus-mode selector: Also shown, this switch sets the camera itself to manual focusing (M) or autofocusing (AF). Manual focusing is fairly simple: Just rotate the focus ring on the lens to bring your subject into focus. The placement and appearance of the focus ring depend on the lens; the figure shows you the one on the 18–105mm kit lens.